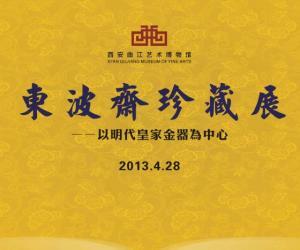 The theme for special exhibition is Dong Bo Zhai Collection. This is the first special show of Dong Bo Zhai Collection series in China. It displays nearly 200 items of royal gold wares during Wanli period, Ming Dynasty (1573--1620), including earrings, headwear, finger rings, necklaces and other ornaments. These splendid and luxury gold wares have been applied with superb and meticulous techniques peculiar to the royal.